The drive up to Kanchanaburi wasn't what I'd hoped for. Being mostly protected area and with the Ratchaburi canals being fed from the River Kwae I expected forests and hills but it isn't. It is mostly flat arable farmland. 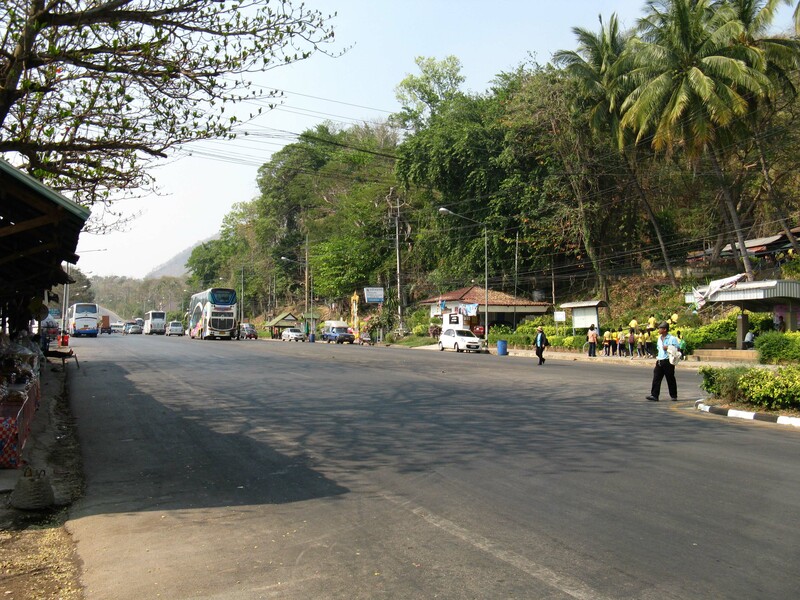 It started out as interesting driving along route 3291 which runs alongside the Khao Ngu mountains and that leads onto route 3357 which follows the canal but after that, nothing. The best bit of this journey was that you could really floor it. We didn't see another vehicle on the narrow roads until we got to Kachanaburi city limit except the odd truck that we could easily pass. I guess this counts as 'off the beaten track' on the grounds that the only sign of civilization was a Highway Police station on a major junction. I Don't know why it was there either because, as you should, I stopped, looked both ways, and you could see for miles along the road, and there was absolutely nothing. In Thailand this is unusual, there is always someone in a truck somewhere, but here the roads were empty in every direction. There wasn't even a village to be seen. This got me to thinking that although Kanchanaburi is known for its war graves and the 'Bridge on the River Kwai', which everybody seems to think is in Burma, and is frequently visited by British, Dutch, Australian, and even Japanese tourists, you can still get off the beaten track when you go to tourist destinations like Kanch'. If you Google the bridge you get this: "Bridge on the River Kwai. An adaptation of the Pierre Bouelle novel about POWs in Burma". Which says it all really. Mike Kaplan of Variety wrote the review for the movie, and whilst I get his 1957 take on how beautifully the movie was cast, he gets the facts all wrong. Sadly people learn from Hollywood so when pretentious movie reviewers get the history wrong so does the film-goer. At no time in the book or movie does Pierre Bouelle say it took place in Burma. The River Kwai, Bouelle later explained, is the French spelling of Kwae and it is the Americans who have changed the pronunciation. Now I find that highly believable! 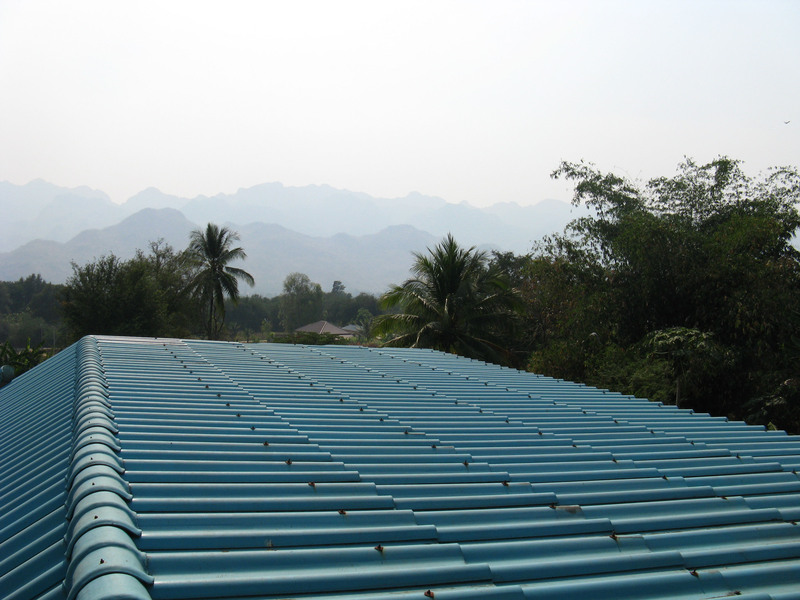 Bouelle's story though is meant to be here in Kanchanburi. It is a novel but remarkably close to the truth and even has a couple of characters who were real. It's a tragic tale and I'd suggest if you are holidaying now is not the time to visit the museums or war graves because it is truly emotional. 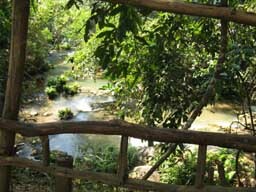 There are places in Kanchanaburi that escape the tourists although you will ocassionally run into a gang of lillywhite pensioners that have been ferried there in a silver Toyota tour bus and if you don't want that then Kanchanaburi city is not for you. We arrived late afternoon and the sun was on its way down. Arriving on spec can be a mistake in Kanchers especially as the street lighting isn't great. Although in my opinion that's a plus. As a result we booked into a riverside hotel on the east side of the river that I won't name because it was very good with a minor exception. 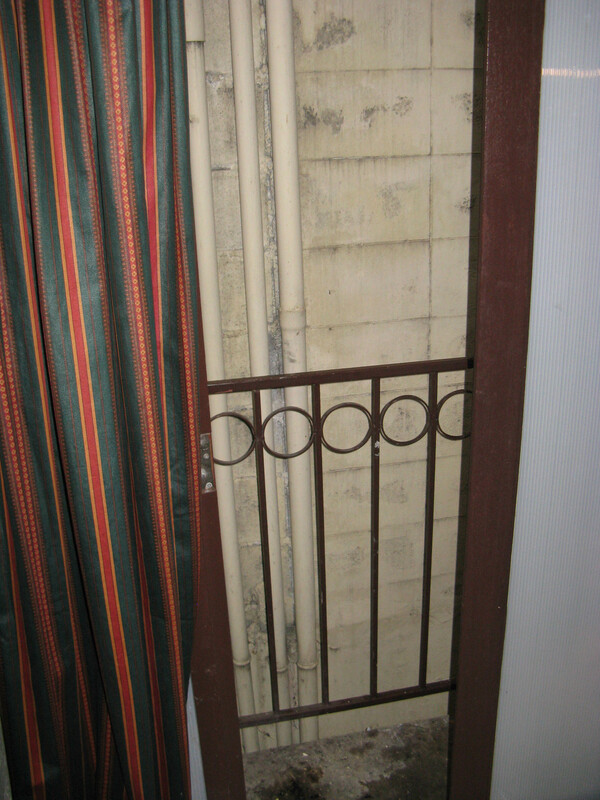 All the river view rooms were full and so we took a room without a view based on the reception lobby that was really enticing and the fact that it had a balcony. 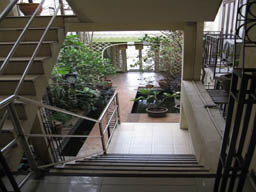 The lobby had fountains and running water into pools with huge Koi carp in and water lillies floating with fish nibbling at them. It was pretty and relaxing and I liked it. However in the room, we had a JVC TV, which I never watch when we are on our travels anyway, but it unsurprisingly didn't work and probably hadn't for at least a decade and then Waan went to the balcony for a cigarette. 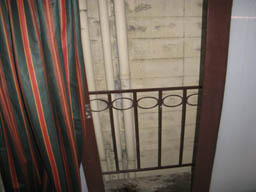 Imagine our surprise when she opened the curtain. Personally I couldn't stop laughing. To get off the beaten track go North of the city on the South side of the river. 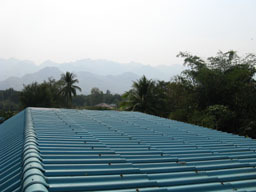 A really good place to stay is Ban Sabai Sabai - Kanchanaburi Guest House just off Sangchuto Road or to be more precise 102/3 Moo 4. It is stupidly cheap, does good food, and best of all feels much more luxurious than it costs. For restaurants try Au Resort & Coffee drink which has the unenviable address of 119/71190, Soi Moo Ban Phrueksakan 4 Soi 3. 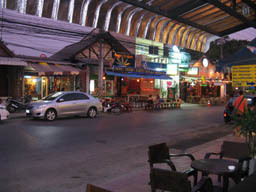 Bugger to find but Thais love the place and the food is excellent and they have a spa with massage pools and rooms. Ask a local to direct you to the Grandfather Bridge or สะพานปู่ยิ้ม - ปู่เหรียญรวมใจ and cross the river and try 'My Son's Kitchen'. This is a thoroughly Thai place and is known locally as ครัวลูกชายนายต๋อย pronounced something like krua look chai. 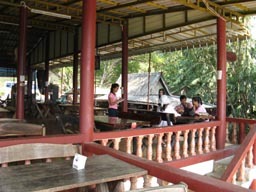 It is a row of tables along the riverbank where they serve you beer with a bucket of ice and spicy genuine Thai food and the price will not break your pocket. Because it was late we headed down Maenamkwai Road, renamed so tourists won't keep asking where the River Kwai is. Yep, Hollywood has successfully renamed a major river and its surrounding street names in South East Asia. Actually the Yanks have managed to do the same in Laos where the Mae Nam Khong is now known as the Mekong and is why I like to be 'Off the beaten track' because I don't like what tourism does to SEA. However what I do like about tourism is places like the superbly if not inaptly named 'Sugar Member'. 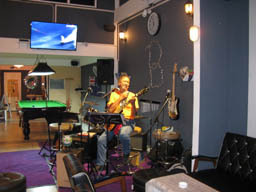 I think the owner may well be a New Zealander with a sense of humour though the bar is more popular with locals. 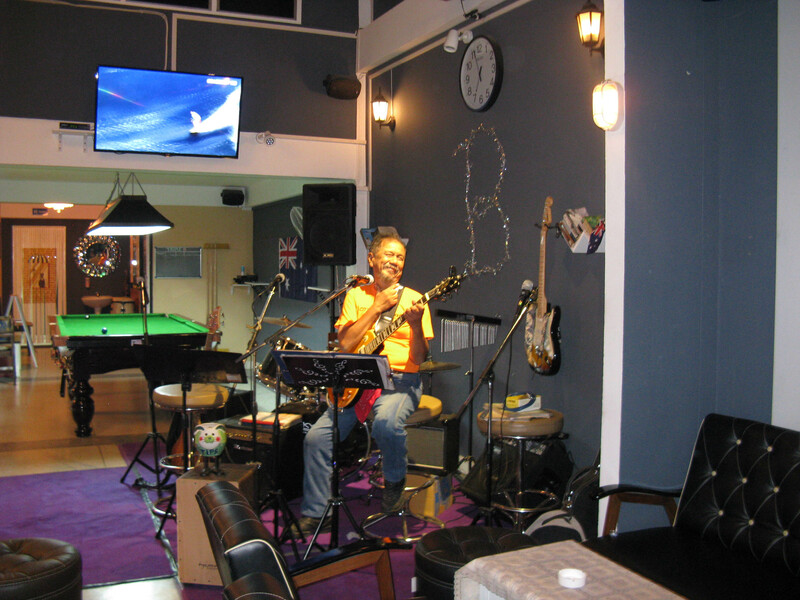 And across the road is the Blues Bar and the resident blues singer, an aged but sincerely talented Thai chap with a gorgeous voice and a songlist to match, was mesmerising. We stayed all evening till around 2am. 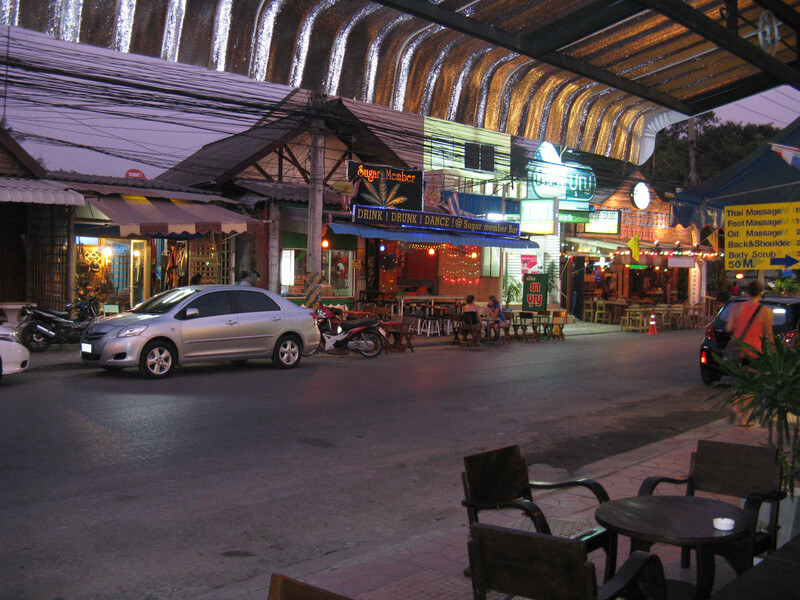 This street is a tourist spot but a great place to sink a few cool beers and take in some good music and great company. The Bridge is obviously a big tourist attraction along with Wang Pho and Hellfire Pass and most of the visitors are here to remember an ancestor. The Bridge train station is rarely used by the tourists although the train service is trying to attract more of them but usually they drift off into the little market stalls behind the station. I have rarely seen tourists in the shops in the square behind the market stalls. Most of it is gemstones and other junk but it has more authentic stuff than a 'Bridge over the river kwai Tee shirt' especially in the Royal Art Centre and the Souvenirs Museum. We headed across the river, by car, because we were off to our intended destination this fresh new morning with another hang-over and captured some early morning shots of the Chinese temple. I love the way they came out all pastelly like a jigsaw lid. There are few graves here. Most of the Chinese remains are lost. These were not all soldiers, or resistence, or Royal Guard. These were mostly civilians taken by force from villages in China. Records show they existed and they were enslaved by the Japanese, but the Japanese didn't keep any records, instead they left a historical tragedy. Outside the temple is a sign that a Chinese visitor told me says the temple is for all the 1.2 million taken as slaves and the 800,000 who were murdered. It is a story so intense that even the Japanese cannot accept they really did this. They are still in denial. We headed off to Sai Yok and stopped part way, only about half an hour or so, for breakfast. 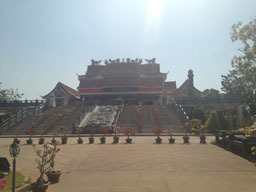 This is a well known stop-off at Wang Pho train station. If you come on the train you go over the world famous Wang Pho Viaduct and Krasae Cave Dangerous Curve. A train journey that I can recommend and guarantee you will recognise it from several movies. Behind the train station is a couple of excellent restaurants. Phimpaya Restaurant and Kris Restaurant or ร้านอาหารพิมพญา and สวนอาหารวังโพธิ์ both next door to each other in Lum Sum and both worth a visit. If you need accomodation at the back of both these restaurants is Baansaiyok Homestays or บ้านไทรโยค โฮมสเตย์ which is a magnificent place to sleep over though I'd skip breakfast and eat in Kris's. You will see tourists here though not inundated and it is off the beaten track because of where it leads to and the fact that you have to start using Thai spellings to find these places. You will also find that as you head on up into the mountains the use of spoken English becomes less and less and the next stop for us would be Sai Yok National Park. Again this is not an unknown place and yet it gets few foreign visitors whilst popular with Thais. 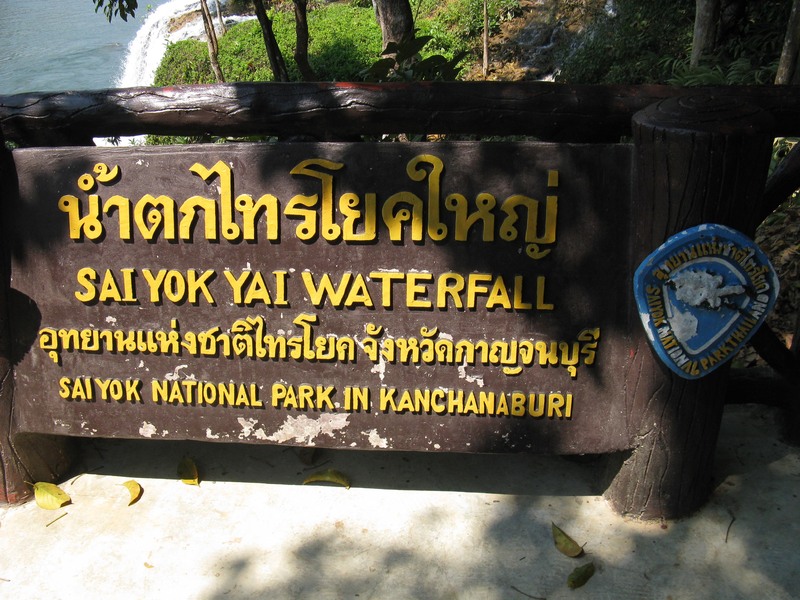 The next place along Route 323 to stop is Nam Tok Sai Yok Noi which means Sai Yok Small Waterfall. The falls have created natural swimming pools and the gently falling water is really refreshing when you stand under it and across the road are market stalls, shops, and restaurants. Do not pass this place over. It is an absolute must of a stop-over for refreshment, shopping, and food. 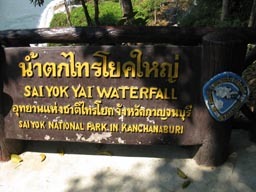 We'll be stopping on the way back from our goal of Sai Yok Yai National Park and the waterfalls. Although the park does try to lend itself to disabled visitors I feel you need to be fairly active to be able to walk the forest. It wore me out anyway. I don't think it necessary to be fit, just agile enough to walk a long way uphill, and then down again. I tried to do a panorama view of the tiny streams that flow gently toward the emense waterfall but it just spreads so far and wide I failed so I had to video one stream instead. There is a limit to how much walking you can do in the sub-tropical climate of Thailand but on the other side of Route 323 is Erewan National Park. 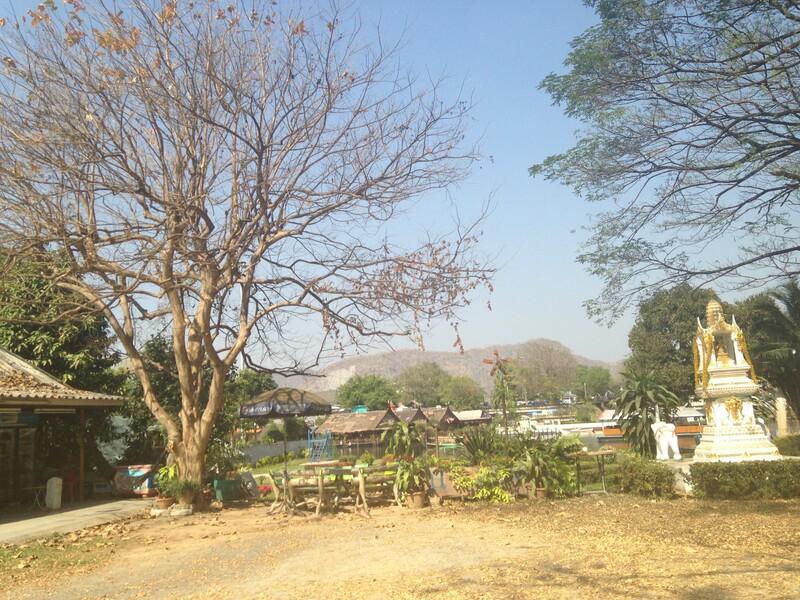 If you head south on 323 and then cross the River Kwai to head North again there are some really good views of the park and mountains as well as places to stay and to eat. There is even a visitor centre. 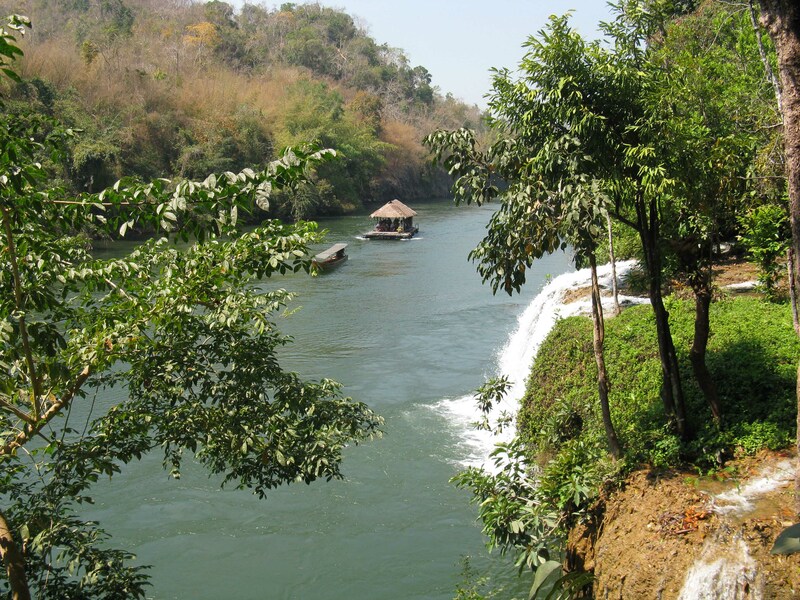 On the West side of the river is Erewan Falls which are worth seeing but to get off the beaten track go North in the park to Huay Mae Khamin Waterfall. In Thai it is spelt น้ำตกห้วยแม่ขมิ้น but you won't need to copy and print this as all the sign posts are in English. 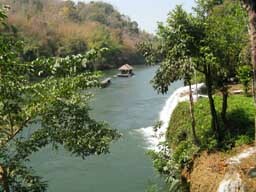 To get to the falls head for Khuean Srinagarindra National Park but the falls is on the West side of the reservior. Despite the signs nobody from an English speaking country seems to know about the beauty spot and the only tourists you'll run into are Thais camping in tents. The waterfall is prettier, has pools that you can swim in, and is the colour of mineral water fresh from the rock below. 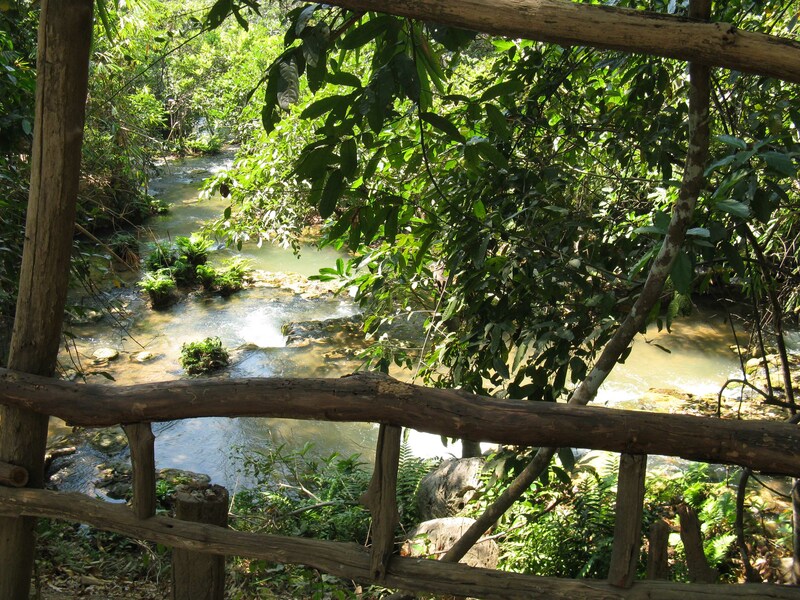 Which in effect is what it is because this tiny river and huge reservior is the source of the River Kwai Yai. When leaving the falls head North by the reservior and follow the park road for about 60Km and you come to another waterfall called Phatad (on Google it is called Pha Tat) the Thai name is น้ำตกผาตาด but again there are English signs and again only Thais seem to know about this absolute gem. In fact when we visited we were the only people there. With the sound of Hornbills and Gibbons in the forest above it felt special. If you want to stay over there is Ban Phasawan in 55 Moo 5 Sahakon Nikhom which is a little over half way to Pha Tat and in a nice secluded location with all you need in the resort. There is though an odd little place a 5 minute walk away called the Pha Tad Watershed Conservation and Management Unit where nobody speaks English despite all their literature being in English (well, English of sorts anyway). When you have had enough of discovering what seclusion means at the waterfalls head South on Route 3049 to get back to Route 323 and I'd suggest a Sat Nav is a must for this journey because the roads have no signs or street names and I discovered that if you ask a Thai if this road is Route 3049 they have absolutely no idea. They'll tell you what the locals call the road around here. 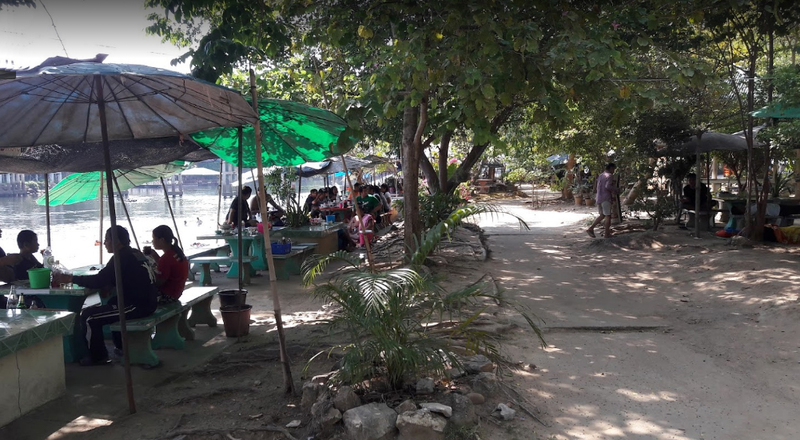 If you want accomodation, when you get to the main road (323) turn left then first right and follow the road and look for a sign on the left that says Ban Lek Rimthan Resort. I think it was 200 Baht per night and food wasn't much more and this place has a feel of Issan about it. Simple, understated, yet comfortable and beautiful. Their gardens alone are worth seeing. Five minutes along the same little track (half an hour if you are walking) is Hin Dat. As you approach the tiny village you know you really are in a unspoilt place and yet there is a coffee house, called Bualaung, which does good food too and a row of stalls selling iced coffee and fresh fruit and my favourite Nam Tang Moh, a refreshing long drink made from watermelon, crushed ice, and condensed milk. There is even a ATM. Every sign is Thai so what you are looking for is น้ำพุร้อนหินดาด On the main road at the junction on the left is a pretty good shop that sells anything you may have run out of and opposite is a Police station though I wouldn't hold out much hope for the officers speaking English. When you get to the car park (It'll have a few coaches parked in it, so you'll know you are there) you are looking for ศูนย์การเรียนชุมชนตำบลหินดาด which will take you on a walk through a really beautiful but small park with a visitor centre and น้ำพุร้อนหินด which is the hot springs. This place is very popular so gets a bit crowded but it properly counts as off the beaten track because you are not the only one who has never heard of it. 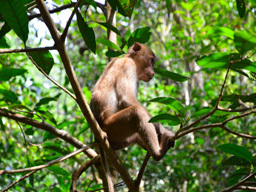 Head North again on Route 323 for about 60Km and you come to Khao Laem National Park. 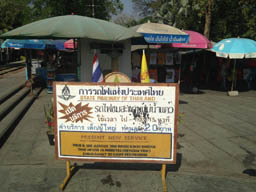 On the left there is a sign that says Pom Pee Viewing which is typical of Thai word play because it says 'Watch me urinate' but means 'Viewpoint for a place called Pom Pee'. There is an entrance fee which varies from 10 Baht for a Thai child to 500 Baht to stay overnight but for us two and the car was 160 Baht. 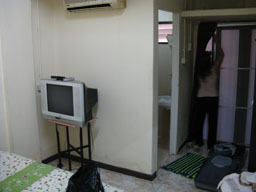 There is accomodation but you need to bring everything with you because there is no shops or restaurants. This is meant to be a place of natural beauty, and it is. 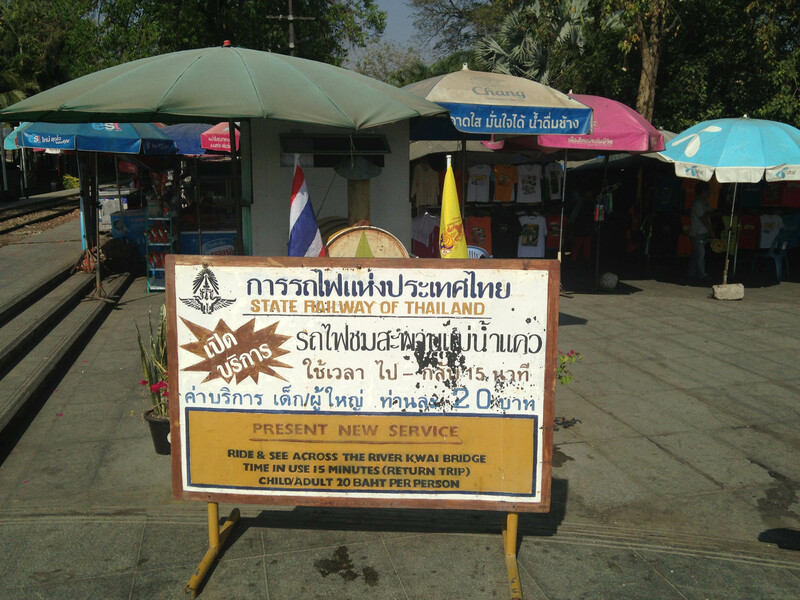 Now, if you like driving like Clarkson on a lonely mountain road or you love motorbiking through twisty lanes then when you pass Pom Pee take the next right at the tiny village of Prang Phe and follow the road till you cannot go any further. I promise you it is a treat, and if you like the idea of rafting, on the left at the end of the village is a small business called Kasem Raft. 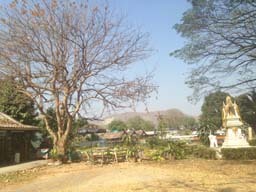 30Km further North you come to Sangkla Buri. 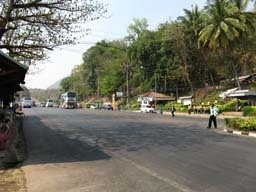 This is a tourist stop off for those heading for Burma but it is a good place to stay and to look around. 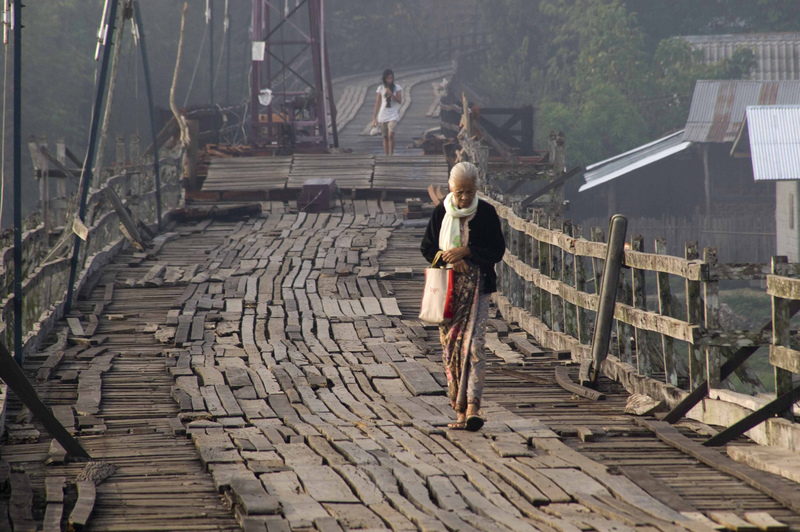 Amongst the most popular attractions are the Mon Bridge which is the oldest and probably only one left wooden bridge. Although originally it was bamboo. Sangkla Buri Market is well known and a great place to find souvenirs. Most famous of all is the Mon Hill Tribe village which has become so popular that commercialism has taken over but having said that, it is still worth the visit, and bear in mind everything they sell is hand made. 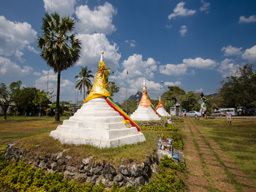 A few kilometres further North is the Three Pagodas Pass which is the official border between Burma and Thailand. For me, the 300Km road from Ratchaburi to Payathonzu in Burma that is Route 323 but called by Thais all along its route Thanon Saengchuto really is, 'Off The Beaten Track'.